The concept of “last few mile mobility” is one which we'll all grow accustomed to over the next decade as the world's cities become more congested and non-polluting micro mobility concepts begin to supplement other forms of transport. In the last year alone we've seen Toyota's Winglet, Honda's U3-X, Nissan's electric skis, and now Volkswagen has shown a micro mobility concept which it has dubbed the "Bik.e" – a folding electric bike with one of the most ingenious folding mechanisms we've seen. 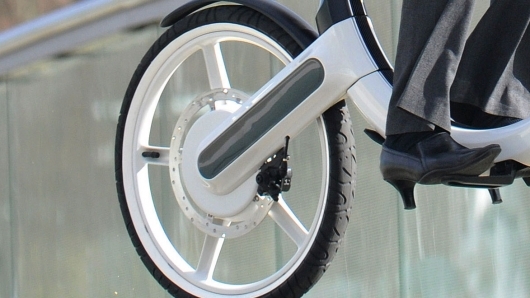 With a range of 20 kilometres (12.5 miles), the Bik.e has 20 inch wheels and folds to a footprint identical to that of a car spare tyre, enabling it to be stowed away easily. 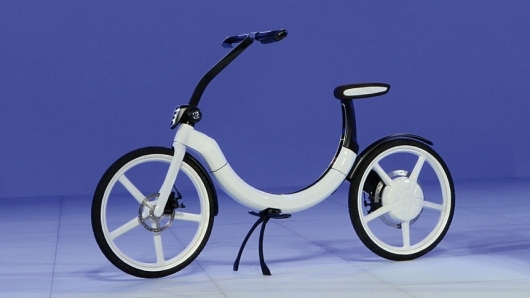 Whatsmore, the bik.e will definitely see production, and possibly even before the end of the year. VW's choice of form factor is as fascinating as its choice of a recognisable name is inspired. 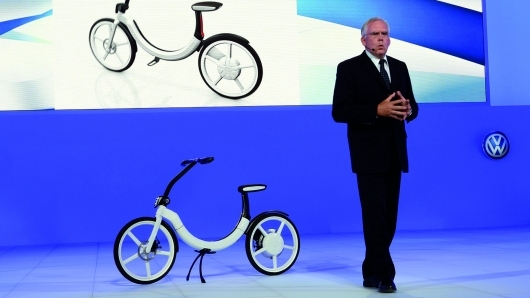 The Bik.e could turn out to be as important to VW as the iPod has been to Apple. VW's choice of form factor is fascinating and it's an enormous shame that more detail has not been revealed. 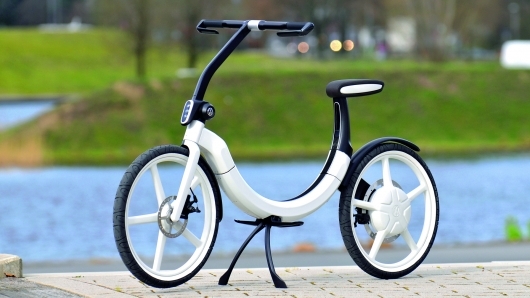 The bik.e reportedly weighs in at under 20 kilograms – porky for a bicycle but relatively light for an electric bike. Honda's U3-X and Toyota's Winglet weigh in at half the Bik.e's weight but the folding mechanism enables the bike to sit above the spare tyre in the wheel well without taking up any of the luggage space of most vehicles according to Volkswagen. Attempting to match Honda's U3-X weight and functionality would probably be beyond a stadium full of Phds but in creating a micro mobility concept designed to be an adjunct to a larger vehicle, VW recognises that 20 kg is relatively inconsequential. No details have been given on its charging time, though it has been revealed that it can charge from the battery of the “mothership” - the car it will reside within. So if there's a powerpoint available at the destination, the bik.e can travel its full range of 20 kilometres. If not, then it can still offer a distance of 10km there and 10km back to the parent vehicle where it can be charged in transit. 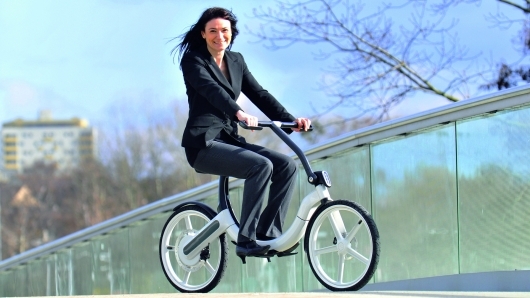 The Bik.e has a top speed of 20 kmh (12.5mph), and reports from Beijing suggest that while it could easily be faster, its top speed has been pegged at 20 kmh because it enable the machine to be ridden in Germany without a helmet. Several global trends are driving the need for personal micro mobility solutions - the world's population is ageing rapidly, the world is drowning in excrement and the world's roads will become hopelessly congested within a few decades. Not much else is known at this stage about the Bik.e though it clearly uses batteries stored within the frame, cable-operated disc brakes on each wheel, injection moulded aluminium or magnesium construction reminiscent of the Gocycle) and integrated LED lighting. Even the split centrestand is a stroke of design genius, offering far better stability than the traditional prop-stand of a bicycle yet folding almost flush with the frame when in use. Volkswagen's sustainable design expertise is beginning to look mighty impressive and could have yielded an iconic design for the ages – perhaps even as representative of Volkswagen's brand values as that previous icon, the Beetle.